Picture this: You and your crew are driving through the wet and dreary streets of an unknown city in some rust bucket of a van. On your last heist you picked up an advertisement for a minimart bragging that their prices were so low, you’d end up leaving with more money than you came with. And that’s exactly what you plan to do. A bead of sweat rolls down your face as you pull up to the minimart because you heard the owner’s got an extensive security system and is packing heat. The quelling sound of the rain hitting the pavement does little to calm your nerves. As you enter the convenience store your partner notices a secluded door in the back of the building that leads to the camera system. You see that the clerk monitors the cameras from the register, so you wait until the clerk leaves for the bathroom to run through the door, past the camera, and to the switch to turn off the cameras. At the same time your partner follows the clerk into the bathroom and holds him up. The clerk is too scared to notice that your partner is only packing a toy gun. On your way to the bathroom you run by the register, grab some cash, the clerk’s shotgun, and then you knock the clerk out. When he lands on the bathroom tile a key falls out of his pocket, which leads to another back room and a safe. Your partner breaks the safe with a safebuster, and the two of you make a mad dash back to the van to make a clean getaway. This, my friends, is The Masterplan. The organic excitement bred in the heist I described above is from one of the earlier missions in the game, but you actually start off breaking out of jail in one of the wonkiest tutorials I’ve experienced to date (mobile games aside). You’re lead up to the tutorial with a little backstory about your character, Joey Green, who was an honest working man until the Nixon era did him in. Left unemployed, Joey is left to selling drugs because it’s the only way to make a living. After finding some initial success, Nixon fabricated a war on drugs and Joey ends up gunned down in cold blood by some crooked cops. Fortunately, Joey survives and wakes up in said jail cell where the game begins to teach the mechanics in the clumsiest way possible. In the cell you learn the basics on how to control your character, but even more interesting, you’ll learn how your character can control others with intimidation. In the tutorial you’ll find a plastic gun with no ammo in a cake (a possible Portal reference) and you use this gun to force the only cop on duty into getting the key, unlocking your cell, and letting you escape. The power of intimidation is one of the game’s most inspired mechanics and plays an integral role in every heist you’ll pull. Whether it’s using it just to lead your victim to their secluded death or forcing them to commit atrocities for you, there is no denying its effectiveness. Oddly enough, it’s a mechanic that is incredibly flexible. Players can choose to just knock out bystanders, kill them, or simply manipulate them. Taking any of these paths will dramatically change the way a heist is pulled off, and can make seemingly easy heists become much more difficult. Pulling off a perfect heist requires a lot of careful planning, however. You’ll usually have multiple objectives you need to hit and there are plenty of things to go wrong. Civilians are perhaps the most annoying variable in the game. They just come and go as they please and if they see anything suspicious then they run off to go call the cops. Security guards and security cameras are other obstacles in your way, though they can be easy to deal with for the most part. Both have field of view cones, but you can be spotted by a security camera and be totally fine if no one is there watching it. And even if there is someone then you’ll have a few seconds to get out of the cone before they become suspicious and check things out. Security guards on their own will ignore you until they find you somewhere you aren’t supposed to be or they catch you doing something illegal. To be frank, most of the game’s difficulty lies in its level design. Dealing with guards and security cameras are simple until the level is arranged in a way that you’re forced to deal with them in uncomfortable or high pressure scenarios. Most of the people in each level have their own patterns of behavior which creates opportunities to pull off fun things. Knocking people out while they’re on the can is always a favorite of mine. But the game can be a bit frustrating when there is a maze of corridors and each door seems to be locked by a different color key. So, while I mostly enjoy each heist’s layout, I also find myself wanting to turn the game off when it seems like I’m going to have to painstakingly crawl my way through a dungeon of locked doors and security cameras. To be honest, I thought this game was going to be a lot like Monaco, but I’m pleasantly surprised to report that it plays more like SWAT 4 or Door Kickers. The art design will undoubtedly be hit or miss for a lot of players. I personally thought the characters looked like blown up sprites from GTA II, and the art style really kind of fits the game’s overall presentation. Everything is a little bit cheeky and fun — even when the game’s not. The not fun parts are far and few between, though. Everything about the game feels really organic. New heists are unlocked by finding memos of interesting places littered about the world, guns are unlocked by finding suppliers, and you can hire fresh blood by choosing from a pool of potential candidates. Even the heists feel like the NPCs have their own routines and you’re just there to mess it all up. I did find some of the controls to be clunky. For instance, picking up items on the ground requires a right click which is the same button to open your character’s inventory screen. So when your character is standing on top of items you’re trying to pick up then it always prioritizes the inventory action over the pick up action. Fortunately, these are minor issues at best. 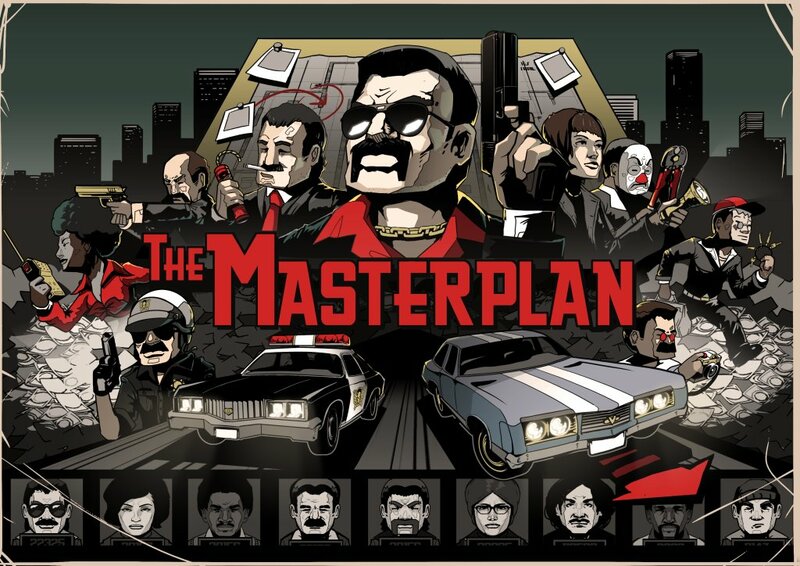 The Masterplan retails for $19.99 on Steam, and while I haven’t played through the game fully yet, I absolutely love what’s here. Players that like methodical games where you have to manage multiple team members to solve what is essentially a glorified puzzle will really like the game. For those of you still on the fence, wait for a sale.